No, they wont fix you, they don't have schizophrenia, probably no purple haze either, they are in their golden years, but hey-they aren't on the road to nowhere either! 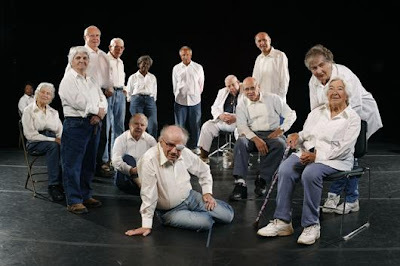 This is the story of a group of elderly men & women from Northampton, Massachusetts who first formed in 1982. They've toured the world, singing their unique brand of musical reinterpretations to sell-out audiences constantly. And it is so easy to see why this group has connected so well to so many people. They are just ordinary everyday people who just love to sing. But, the crucial difference with this bunch is what type of music they perform. Led by the relatively youthful Bob Cilman, he isn't content with them just performing oldtime standards exclusively. He decided that more challenging material might push them out of their safety zone & that they might actually enjoy singing more contemporary material occasionally. If only they knew just what songs he had in mind, they might not have been so quick to to say yes! So in come songs by the Rolling Stones, Talking heads, Sonic Youth, Outkast, Ramones to name but a few. The look on their faces as they are introduced to these new fangled things is priceless, and more than a challenge to say the least. The movie follows the group rehearsing for a new show & tour in 2006, and the dogged efforts of Bob Cilman to get them to understand & perform the new tunes to a reasonable standard. It becomes rapidly obvious however, that he has got his work cut out for him in no uncertain terms. Two tunes that come in for the most scrutiny are james Browns' "I got you (I Feel Good)" & Allen Toussaints "Yes we can (we can can)" The continual hashing of these songs drives Cilman to utter despair at times, but the group persevere constantly, seemingly to no avail. You get the feeling that there is only so much that the group wants to learn, but they are not going to give up that easily! In a large group of this size, its inevitable that a few will stand out from the rest. First up is the incorrigible flirt Eileen, who at a sprightly 96 yrs of age, has a wonderfully positive outlook on life. And definitely loves the attention in the movie from director Stephen Walker. Next into view are the doggedly determined guys: Bob Salvini, Fred Knittle who are being asked to perform a duet together of Coldplays "Fix You" Fred & Bobs' stories are very touching and undoubtedly, very amazing in their attitude to their fellow choir members. They don't want to let anyone down, least of all, themselves. What happens to them is both happy and sad, and safe to be said, extremely moving. This movie is, hand on heart-the best thing I've seen all year. It has moved me like no other movie has done in a long while. I Laughed (Really laughed out loud! ), I cried, I totally connected with this film much than I thought I would. It is absolutely unmissable. Young @ Heart has only one aim really. To tell anyone that may care to watch that the most important thing in how you live your life is your attitude towards it.